Element Pictures had much to celebrate last night at the Old Billingsgate in London where Yorgos Lanthimos' 'The Favourite' swept the boards and picked up a record-breaking 10 wins at the British Independent Film awards. Jessie Buckley won Best Newcomer for her performance in 'Beast'. The Irish produced film scooped some of the major awards including the night's main prize, best British Independent Film, as well as best Director for Lanthimos and best Screenplay for writers Deborah Davis and Tony Mcnamara. Following her win at Venice, Olivia Colman picked up the award for Best Actress with her co-star Rachel Weisz winning best supporting actress. These awards for The Favourite comes on the back of rave reviews from US press including The New York Times ('wildly entertaining’), USA Today ('an abundantly entertaining gem’), The Los Angeles Times ('a devious delight’), The Wall Street Journal ('sizzling hot';) and Rolling Stone ('a bawdy, brilliant triumph’). The Favourite currently has a 95% score on Rotten Tomatoes and is being hotly tipped for Oscars. 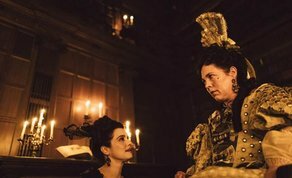 Commenting on last night's wins, Element Pictures Producer Ed Guiney said "I'm thrilled for all involved in The Favourite, we had a wonderful cast and crew who worked on this film led by visionary director Yorgos Lanthimos and we're all hugely grateful to BIFA for this massive recognition." Alessandro Nivola picked up an award for best supporting actor for his role in Sebastian Lelio's Disobedience, also produced by Element Pictures. The Favourite will be released in Ireland on January 1st through Fox Searchlight and 'Disobedience' is in cinemas now.